James Tissot (French, 1836-1902). 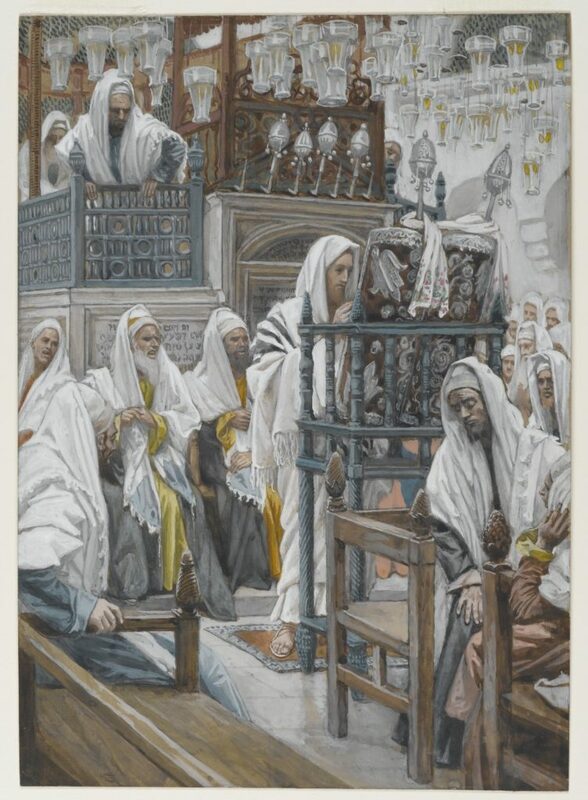 Jesus Unrolls the Book in the Synagogue (Jésus dans la synagogue déroule le livre), 1886-1894. Brooklyn Museum. The lectionary readings for the Third Sunday in Ordinary Time focus on (a) Ezra’s reading of the rediscovered Scriptures to the remnant who returned to Jerusalem from Babylonian captivity and (b) Jesus’ reading of the prophet Isaiah followed by his proclaimation that He is the promised long-awaited messiah. Here are links to two updated and revised doctrinal homily outlines. Central Idea: We are living in the year acceptable to the Lord. Doctrine: The meaning of “gospel.” Practical Application: Daily evangelization.